Encephalitis is an inflammation of the brain, usually caused by a direct viral infection or a hyper-sensitivity reaction to a virus or foreign protein. Brain inflammation caused by a bacterial infection is sometimes called cerebritis. When both the brain and spinal cord are involved, the disorder is called encephalomyelitis. An inflammation of the brain's covering, or meninges, is called meningitis. Encephalitis is an inflammation of the brain. The inflammation is a reaction of the body's immune system to infection or invasion. During the inflammation, the brain's tissues become swollen. The combination of the infection and the immune reaction to it can cause headache and a fever, as well as more severe symptoms in some cases. Approximately 2,000 cases of encephalitis are reported to the Centers for Disease Control in Atlanta, GA each year. The viruses causing primary encephalitis can be epidemic or sporadic. The polio virus is an epidemic cause. Arthropod-borne viral encephalitis is responsible for most epidemic viral encephalitis. The viruses live in animal hosts and mosquitos that transmit the disease. The most common form of non-epidemic or sporadic encephalitis is caused by the herpes simplex virus, type 1 (HSV-1) and has a high rate of death. Mumps is another example of a sporadic cause. Primary encephalitis is caused by direct infection by the virus, while secondary encephalitis is due to a post-infectious immune reaction to viral infection elsewhere in the body. Secondary encephalitis may occur with measles, chickenpox, mumps, rubella, and EBV. In secondary encephalitis, symptoms usually begin five to 10 days after the onset of the disease itself and are related to the breakdown of the myelin sheath that covers nerve fibers. Mosquitoes spread viruses responsible for equine encephalitis (eastern and western types), St. Louis encephalitis, California encephalitis, and Japanese encephalitis. Lyme disease, spread by ticks, can cause encephalitis, as can Colorado tick fever. Rabies is most often spread by animal bites from dogs, cats, mice, raccoons, squirrels, and bats and may cause encephalitis. Equine encephalitis is carried by mosquitoes that do not normally bite humans but do bite horses and birds. It is occasionally picked up from these animals by mosquitoes that do bite humans. Japanese encephalitis and St. Louis encephalitis are also carried by mosquitoes. The risk of contracting a mosquito-borne virus is greatest in mid- to late summer, when mosquitoes are most active, in those rural areas where these viruses are known to exist. Eastern equine encephalitis occurs in eastern and southeastern United States; western equine and California encephalitis occur throughout the West; and St. Louis encephalitis occurs throughout the country. Japanese encephalitis does not occur in the United States, but is found throughout much of Asia. The viruses responsible for these diseases are classified as arbovirus and these diseases are collectively called arbovirus encephalitis. Herpes simplex encephalitis is responsible for 10% of all encephalitis cases and is the main cause of sporadic, fatal encephalitis. In untreated patients, the rate of death is 70% while the mortality is 15-20% in patients who have been treated with acyclovir. The symptoms of herpes simplex encephalitis are fever, rapidly disintegrating mental state, headache, and behavioral changes. Blood tests. These are to detect antibodies to viral antigens, and foreign proteins. Cerebrospinal fluid analysis (spinal tap). This detects viral antigens, and provides culture specimens for the virus or bacteria that may be present in the cerebrospinal fluid. A brain biopsy (surgical gathering of a small tissue sample) may be recommended in some cases where treatment to date has been ineffective and the cause of the encephalitis is unclear. Definite diagnosis by biopsy may allow specific treatment that would otherwise be too risky. Choice of treatment for encephalitis will depend on the cause. Bacterial encephalitis is treated with antibiotics. Viral encephalitis is usually treated with antiviral drugs including acyclovir, ganciclovir, foscarnet, ribovarin, and AZT. Viruses that respond to acyclovir include herpes simplex, the most common cause of sporadic (non-epidemic) encephalitis in the United States. The symptoms of encephalitis may be treated with a number of different drugs. Corticosteroids, including prednisone and dexamethasone, are sometimes prescribed to reduce inflammation and brain swelling. Anticonvulsant drugs, including dilantin and phenytoin, are used to control seizures. Fever may be reduced with acetaminophen or other fever-reducing drugs. Encephalitis symptoms may last several weeks. Most cases of encephalitis are mild, and recovery is usually quick. Mild encephalitis usually leaves no residual neurological problems. Overall, approximately 10% of those with encephalitis die from their infections or complications such as secondary infection. Some forms of encephalitis have more severe courses, including herpes encephalitis, in which mortality is 15-20% with treatment, and 70-80% without. Antiviral treatment is ineffective for eastern equine encephalitis, and mortality is approximately 30%. Because encephalitis is due to infection, it may be prevented by avoiding the infection. Minimizing contact with others who have any of the viral illness listed above may reduce the chances of becoming infected. Most infections are spread by hand-to-hand or hand-to-mouth contact; frequent hand washing may reduce the likelihood of infection if contact cannot be avoided. Mosquito-borne viruses may be avoided by preventing mosquito bites. Mosquitoes are most active at dawn and dusk, and are most common in moist areas with standing water. Minimizing exposed skin and use of mosquito repellents on other areas can reduce the chances of being bitten. Cerebrospinal fluid analysis — A analysis that is important in diagnosing diseases of the central nervous system. The fluid within the spine will indicate the presence of viruses, bacteria, and blood. Infections such as encephalitis will be indicated by an increase of cell count and total protein in the fluid. Computerized tomography (CT) Scan — A test to examine organs within the body and detect evidence of tumors, blood clots, and accumulation of fluids. Electroencephalagram (EEG) — A chart of the brain waves picked up by the electrodes placed on the scalp. Changes in brain wave activity can be an indication of nervous system disorders. Inflammation — A response from the immune system to an injury. The signs are redness, heat, swelling, and pain. Magnetic Resonance Imaging (MRI) — MRI is diagnostic radiography using electromagnetic energy to create an image of the central nervous system (CNS), blood system, and musculoskeletal system. Vaccine — A prepartation containing killed or weakened microorganisms used to build immunity against infection from that microorganism. Virus — A very small organism that can only live within a cell. They are unable to reproduce outside that cell. (en-sef'ă-lī'tis, en-sef-ă-lit'i-dēz), Avoid the nonword en-sef-a-lit'i-dē, an inappropriate back-formation from the plural. /en·ceph·a·li·tis/ (en-sef″ah-li´tis) pl. encephali´tides Inflammation of the brain. acute disseminated encephalitis see under encephalomyelitis. equine encephalitis see under encephalomyelitis. hemorrhagic encephalitis that in which there is inflammation of the brain with hemorrhagic foci and perivascular exudate. herpes encephalitis that caused by herpesvirus, characterized by hemorrhagic necrosis of parts of the temporal and frontal lobes. HIV encephalitis see under encephalopathy. Japanese B encephalitis a form of epidemic encephalitis of varying severity, caused by a flavivirus and transmitted by the bites of infected mosquitoes in eastern and southern Asia and nearby islands. La Crosse encephalitis that caused by the La Crosse virus, transmitted by Aedes triseriatus and occurring primarily in children. 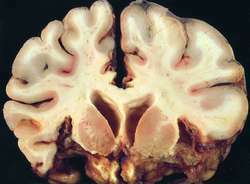 lead encephalitis see under encephalopathy. postinfectious encephalitis , postvaccinal encephalitis acute disseminated encephalomyelitis. St. Louis encephalitis a viral disease first observed in Illinois in 1932, closely resembling western equine encephalomyelitis clinically; it is usually transmitted by mosquitoes. tick-borne encephalitis a form of epidemic encephalitis usually spread by the bites of ticks infected with flaviviruses, sometimes accompanied by degenerative changes in other organs. West Nile encephalitis a usually mild, febrile form caused by the flavivirus West Nile virus, transmitted by Culex mosquitoes and first observed in Uganda; symptoms may include drowsiness, severe frontal headache, maculopapular rash, abdominal pain, loss of appetite, nausea, and generalized lymphadenopathy. an inflammatory condition of the brain. The cause is usually an arbovirus infection transmitted by the bite of an infected mosquito, but it may be the result of lead or other poisoning or of hemorrhage. Certain protozoal infections such as toxoplasmosis can cause encephalitis in immunocompromised patients. Postinfectious encephalitis occurs as a complication of another infection, such as chickenpox, influenza, or measles, or after smallpox vaccination. The condition is characterized by headache, neck pain, fever, nausea, and vomiting. Neurological disturbances, including seizures, personality change, irritability, lethargy, paralysis, weakness, and coma, may occur. The outcome depends on the cause, the age and condition of the person, and the extent of inflammation. Severe inflammation with destruction of nerve tissue may result in a seizure disorder, loss of a special sense or other permanent neurological problem, or death. Usually the inflammation involves the spinal cord and brain; hence, in most cases a more accurate term is encephalomyelitis. Compare meningitis. See also equine encephalitis. Inflammation of the brain, usually caused by a virus. Headache, stiff neck and back, nausea, vomiting. CT with and without contrast; MRI after initial evaluation. Meningoencephalitis Neurology Inflammation of the brain, usually caused by a virus Clinical Findings of aseptic meningitis–headache, stiff neck and back, fever, N&V Imaging CT without and with contrast; MRI after initial evaluation. See Acute disseminated encephalitis, California encephalitis, Eastern equine encephalitis, Flea bite encephalitis, Granulomatous amebic encephalitis, Herpes simplex encephalitis, Japanese encephalitis, La Crosse encephalitis, Lyme meningoencephalitis, Murray Valley encephalitis, Primary amebic meningoencephalitis, Rasmussen's encephalitis, St. Louis encephalitis, Venezuelan equine encephalitis, Viral encephalitis, Von Economo's encephalitis, Western equine encephalitis. Cf Encephalopathy. Inflammation of the brain parenchyma. Inflammation of the brain, most commonly from infection, usually by viruses. These include herpes simplex, herpes zoster, ARBOVIRUSES, polioviruses, echoviruses or Coxsackie viruses. Secondary encephalitis may follow mumps, measles, rubella, and chickenpox. Encephalitis causes severe headache, fever, vomiting, sickness, stiff neck and seizures, and may progress to mental confusion, coma and death. an inflammatory viral disease of the human CENTRAL NERVOUS SYSTEM that is ENDEMIC in parts of North America. Encephalitis is not to be confused with AFRICAN SLEEPING SICKNESS, which is caused by a trypanosome protozoan. n an inflammatory condition of the brain. inflammation of the brain. Changes in vessel walls, as well as of nervous tissue, are almost a constant feature of encephalitis. There are many types of encephalitis, depending on the causative agent and the structures involved. A large percentage of the cases are caused by viruses, some of them, e.g. equine encephalomyelitis, being transmitted from animals to humans. Clinically encephalitis is characterized by initial signs of nervous irritation including muscle tremor, excitement and convulsions, followed by a stage of loss of function characterized by weakness, paralysis, coma and death. The more acute and serious symptoms may include fever, delirium, convulsions, coma, and, in a significant number of patients, death. Many encephalitides are accompanied by involvement of the spinal cord and are more correctly classified as encephalomyelitides. See also encephalomyelitis. The etiologically or geographically specific diseases are listed under their specific titles. Human pathogens which sometimes infect animals include Central European, Far Eastern Russian tick-borne encephalitides, Omsk hemorrhagic fever, Kyasanur forest disease. Viruses isolated from asymptomatic cases of encephalomyelitis include Kunjun virus. a group of viral encephalitides of humans in which animals play some epidemiological part. See togaviridae, flaviviridae. a demyelinating encephalitis, most severe in the cerebellum and optic tracts, is a feature of infection by canine distemper virus. seen in certain viral infections, e.g. canine distemper, caprine arthritis-encephalitis and visna of sheep. believed to be primarily a disease of birds that are the source of infection for animals, including humans, pigs and horses. Transmission is by mosquito. Affected horses show a wide variety of signs including incoordination, excitability and blindness. Most cases recover. Ruminants show little clinical effect. Pigs are a major source of virus and extensive losses occur by way of encephalitis in young pigs and abortion and stillbirth in adult sows. there is tentative evidence of clinically inapparent infection of horses in Australia with this flavivirus virus during an epidemic of the disease in humans. occurred on the Malaysian peninsula as an epidemic in pig farmers. Pigs are the source of the virus which has antigenic relationship to Hendra virus. a chronic, progressive, sclerosing panencephalitis in mature dogs; characterized by motor and mental deterioration, blindness, pacing and circling. Believed to be caused by distemper virus, but there are distinct differences from distemper encephalitis. an acute disease of the central nervous system seen in patients convalescing from infectious, usually viral, diseases. acute encephalitis sometimes occurring after vaccination, mediated by immune mechanisms. a tick-borne flavivirus disease of humans with serological but no clinical evidence of infection in nearby goats. there is tentative evidence of clinically inapparent infection of horses in Australia with the causative mosquito-borne alphavirus virus of this human disease. a similar and probably identical disease to the flavivirus that causes louping ill of sheep, occurring in central Europe. It is a disease of humans occurring in epidemics related to the prevalence of vector ticks in forests where the disease is most common. Lesions are present in organs other than the brain. The severity varies from mild to fatal. an arthropod-borne flavivirus infection, first observed in 1932 in Illinois. It is a serious pathogen of humans, but does not cause disease in animals. The dengue virus, however, is carried by Aedes mosquitoes, while Japanese encephalitis is carried by the Culex variety. Conclusion: Viral encephalitis is the most common cause of infectious encephalitis; however, other atypical causes should also be noted. We then analyzed brain samples of sheep with nonsuppurative encephalitis of unknown etiology (n = 47), which had been identified within the framework of active disease surveillance in Switzerland (7), by RT-PCR specific for BoAstV-CH15 (online Technical Appendix). 30 children lost their lives due to encephalitis in last 48 hours," Rautela added. Imaging features were suggestive of Rotavirus encephalitis. A change in epidemiology of Japanese encephalitis in Bankura and Purulia districts of West Bengal. Pathological studies on anti-NMDAR encephalitis indicated that the intrathecal antibody synthesis in the disease is associated with the colonization of B-cells and plasma cells in the central nerve system (CNS). KEY WORDS: Encephalitis, Difffusion weighted imaging, Magnetic resonance imaging. Encephalitis is a disease that results in inflammation of the brain, affecting the patient's central nervous system. The NHS advises that the most effective way to reduce your risk of getting encephalitis is to ensure you have the MMR vaccine (for measles, mumps and rubella). Doctors are referring all patients to NBMCH to get the Japanese encephalitis test done. Dr Ava Easton, chief executive of The Encephalitis Society, adds: "We work with a number of research institutes around the world and we're excited to see the advancements that will come from this new centre at Birmingham's QE Hospital.